"Come to the hospitality of the Inn at Kulaniapia, built exclusively as a Hawaiian Bed & Breakfast with resort amenities. Located on 22 lush, tropical acres with waterfalls, botanical gardens, hiking trails, and vistas of unrivaled pristine beauty. 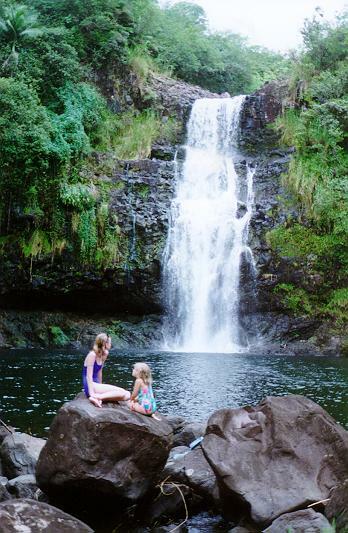 A Hawaii you could only dream of is now an adventure that you can experience." Conveniently located on the ill, 15 minutes away from the Airport, above Hilo. The four guest suites each have their own balconies that either overlook the falls and the river, or the orchard and the ocean. Each suite has a private, tile and marble bath, ceiling fans, and confortable seating areas. For more details visit Kulaniapia web site, just click on this line, and secure your best vacation ever. Let them know that we help you to find them. God bless you. (to return to this page click BACK on your browser).